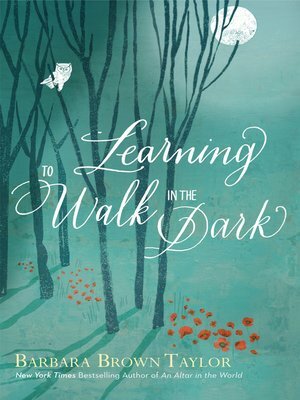 From the New York Times bestselling author of An Altar in the World, Barbara Brown Taylor's Learning to Walk in the Dark provides a way to find spirituality in those times when we don't have all the answers. Taylor has become increasingly uncomfortable with our tendency to associate all that is good with lightness and all that is evil and dangerous with darkness. Doesn't God work in the nighttime as well? In Learning to Walk in the Dark, Taylor asks us to put aside our fears and anxieties and to explore all that God has to teach us "in the dark." She argues that we need to move away from our "solar spirituality" and ease our way into appreciating "lunar spirituality" (since, like the moon, our experience of the light waxes and wanes). Through darkness we find courage, we understand the world in new ways, and we feel God's presence around us, guiding us through things seen and unseen. Often, it is while we are in the dark that we grow the most. With her characteristic charm and literary wisdom, Taylor is our guide through a spirituality of the nighttime, teaching us how to find our footing in times of uncertainty and giving us strength and hope to face all of life's challenging moments.